Careful design and precision engineering are prime factors in the production of these robust and reliable pumps. 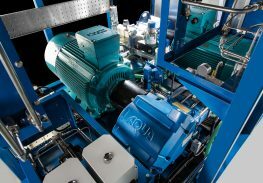 Maintenance of the Aqua® pump range is confined to routine periodic checks and oil changes. Servicing is carried out without the need for special tools, reducing downtime to a minimum. The compact design provides a highly favourable power-to-size ratio, and the lay shaft design allows driving of the pump, through either a pulley, flexible coupling or carden shaft. Produced and packaged to suit individual user requirements, the pumps can be driven by diesel engine, hydraulic or electric motor. They can be supplied for installation into new or existing plant, mounted on our standard skids, trailers or in packages tailored to suit your needs.